"The excitement of seeing a bird explode out of the underbrush... the thrill of watching a well-executed retrieve... these things never change for the true hunting enthusiast." 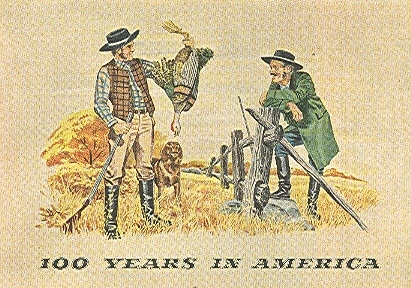 Guess what American adult beverage company celebrated 100 years with this advertisement depicting a turkey dog hunt in the October 1955 issue of Outdoor Life? 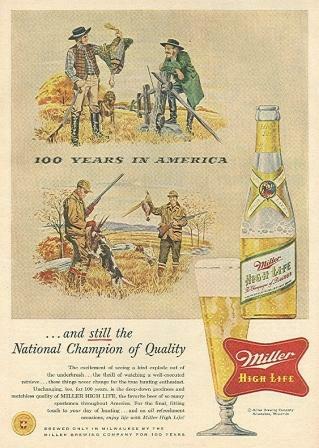 Hint: Brewed in Milwaukee. Click on picture to find out. 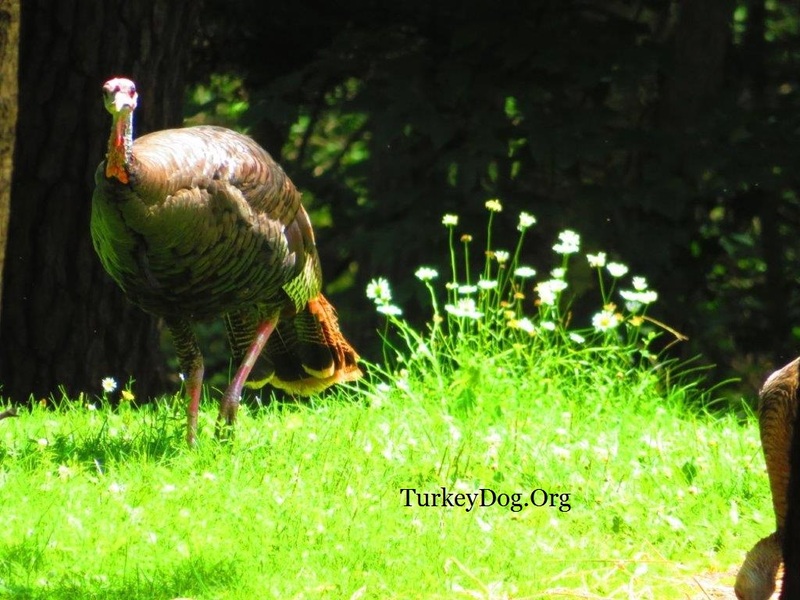 "Dogs trained for turkey hunting are probably the happiest of all canines. No one expects them to stay within 50 yards, hold a point until their owner strolls over or swim through icy waters to fetch ducks bobbing atop distant waves. 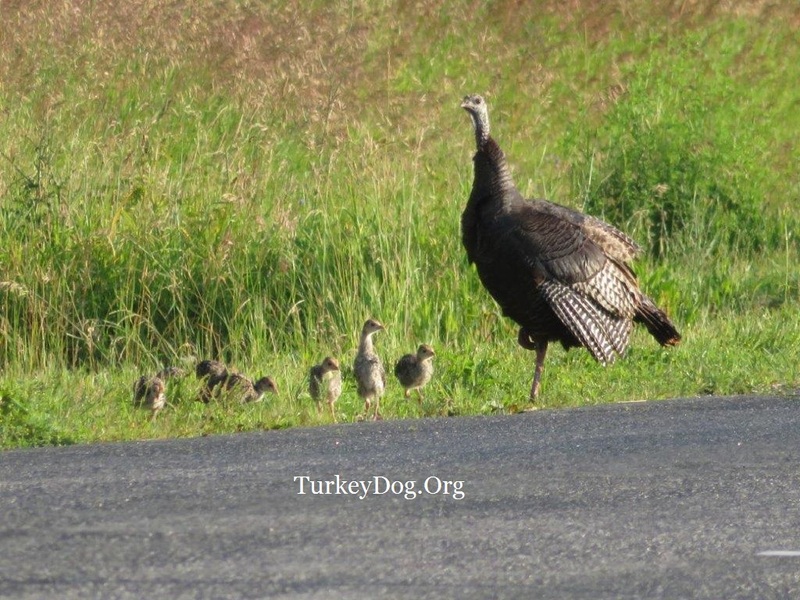 The wild turkey population is the highest in the fall of the year. 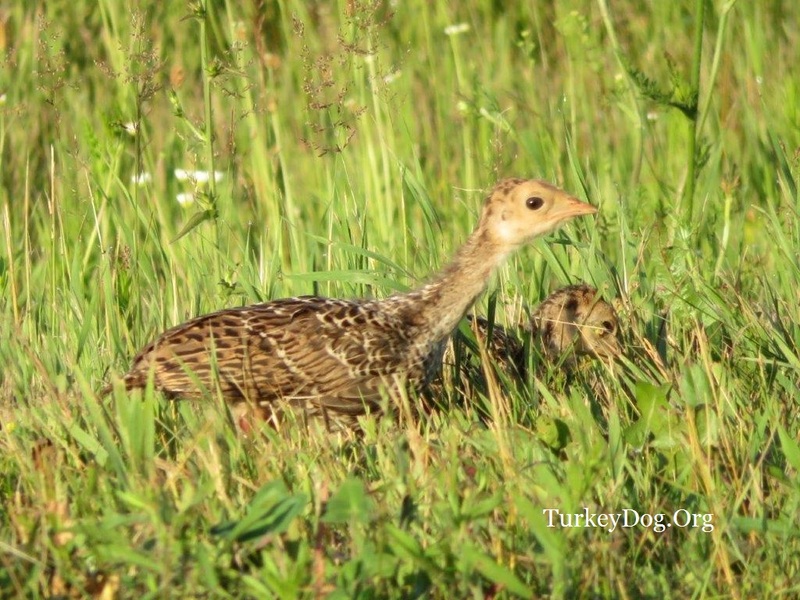 Half of the turkeys born in spring aren't going to make it through their first winter. 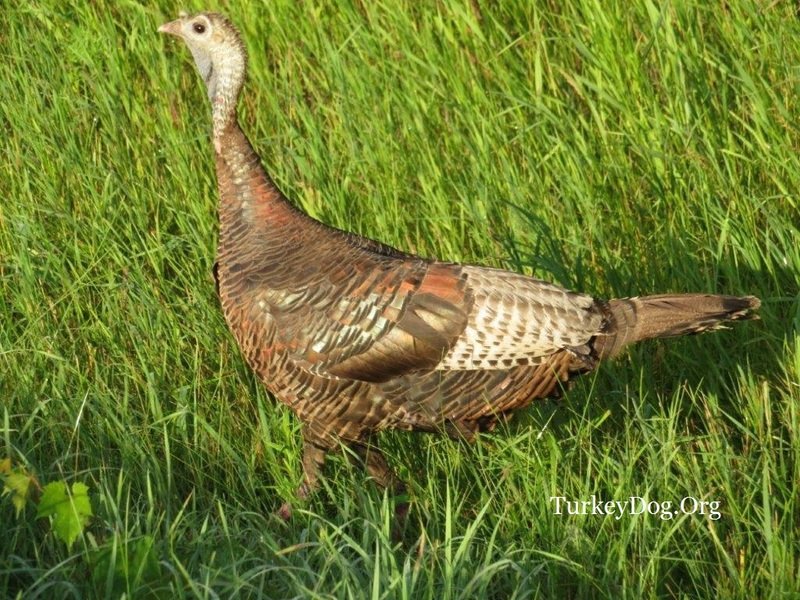 While there's larger birds in North America (American White Pelican, California Condor, Tundra Swans, Trumpeter Swans and Whooping Crane), the wild turkey is the largest wild bird commonly hunted and eaten. Birds are amazing animals. Consider the Bar-headed goose, who cross the highest mountain range in the world, the Himalayas (Mt. Everest), from India's far south to mountain lakes in Mongolia, at 5 miles up, with winds blowing at 100 mph, temperatures 30 or 40° below zero, one-fifth the oxygen at sea level, in a single day. "The first picture is my nephew James who I have hunted with since he was 8 or 9. He shot his first deer with me. This is his first Fall gobbler he shot right at dark, as the gobblers Maggie busted tried to get together, right before roost. 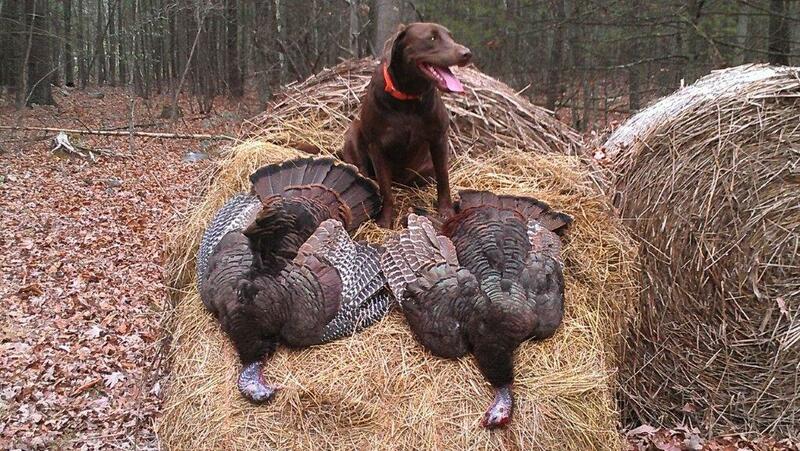 It was in the National Forest in Montgomery County, VA. Maggie was proud of her part in the hunt as were we. This was her first gobbler and she was only a 1 year old! The birds on the hay stacks - those were taken in Shenandoah County. Maggie busted a big flock in the National Forest. My friend Tom shot the first bird I called in, as Maggie sat quiet between my legs. We stayed put and I called in another bird that I missed. I'll never forget the look I got from Maggie, after all her hard work! We could hear the mother hen getting the flock back together, so I sent Maggie to bust them again. She got a second great bust. We set up again further up the mountain, towards the break site and it took a little longer this time before the birds started to talk and reassemble. I proceeded to call one back and made sure I did not miss this time. If I had I am not sure what Maggie would have done to me. At minimum bite off my shirt tail I am sure! 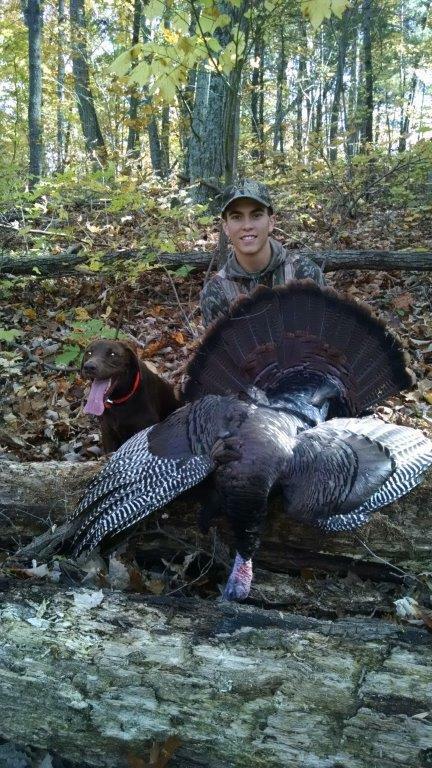 The last picture is my son, with his first Fall gobbler, with the help of our turkey dog Maggie! Ben is 17 now and Maggie is 5. 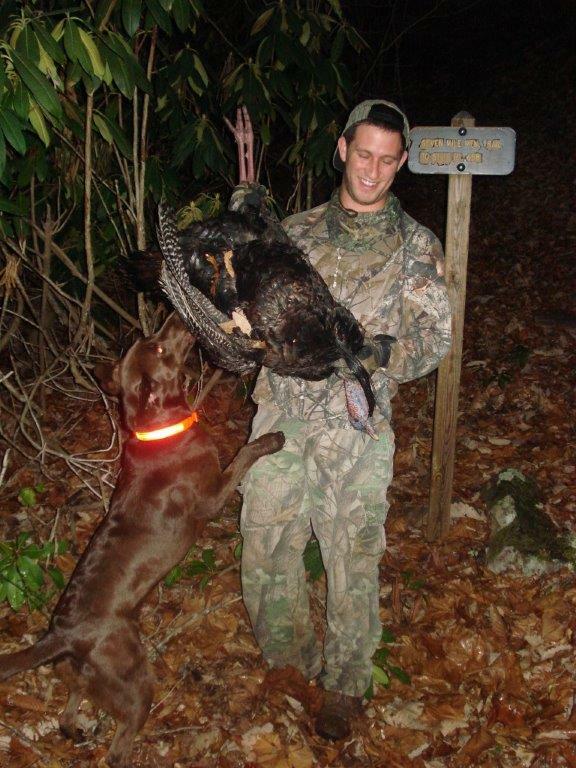 Ben has been hunting since he was 8 and has spent his fair share chasing birds in the Fall VA mountains, but this is his first gobbler Fall or Spring, so he and I were very excited. Maggie is also a therapist and companion for our special needs child. Due to hearing and speaking disabilities, we use hand signals. Maggie learned them too and practices strict obedience. So, when we're hunting, I can signal Maggie from across a canyon; to keep hunting and in what direction, or to come, stay or lie down. All without a training or tracking collar. This chocolate Lab is a real joy to be with all the time. 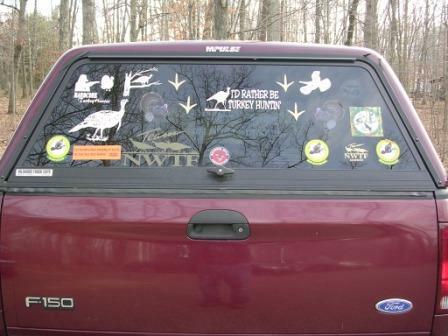 We used to equate the small brain size of a wild turkey to their intelligence. But recent studies say some Birds are as smart as Apes: The cognitive skills of crows, ravens and other corvids are as sophisticated as those of apes, even though they have a much smaller brain. 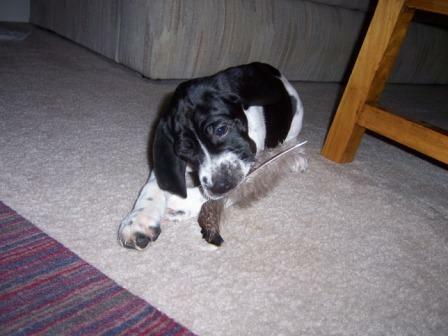 "Here's my dog 'Gia' as a pup, a little older, and with my first fall bird. She's a John Byrnes Appalachian Turkey Dog. 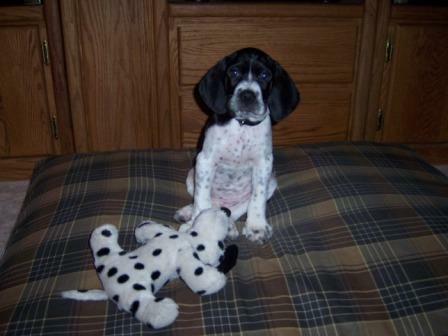 This pure-bred liver and white Pointer would lay quietly in a bag. The only Prisoner of War dog in World War II. "Frank Williams managed to teach Judy to lie still and silent inside a rice sack. When he boarded the ship, Judy climbed into a sack and Williams slung it over his shoulder to take on board. For three hours the men were forced to stand on deck in the searing heat, and for the entire time Judy remained still and silent in the bag on Williams's back." "My new Boytel turkey dog pup 'Heidi'. October 2007." "Here's one of Heidi loving the snow last winter, and appropriating my couch. She's one of the best dogs I ever had." 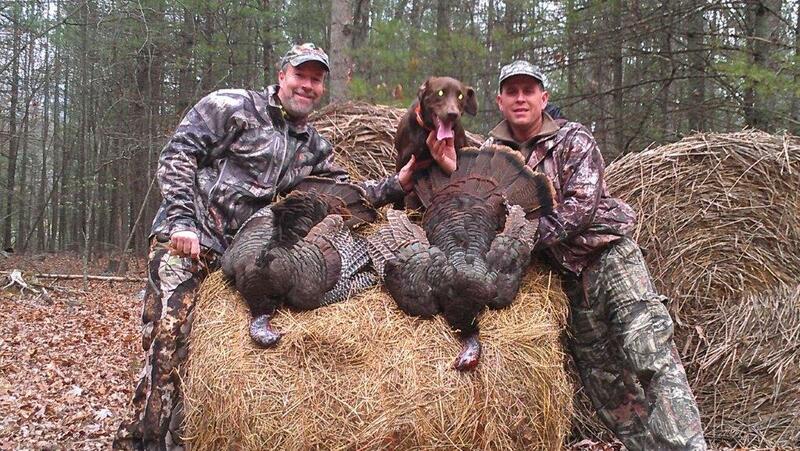 KY Dept of Fish and Wildlife Resources-Kentucky Afield TV host Tim Farmer joins Eddie Williams turkey hunting with dogs. Watch a video of this hen sheltering her 13 poults in the rain. 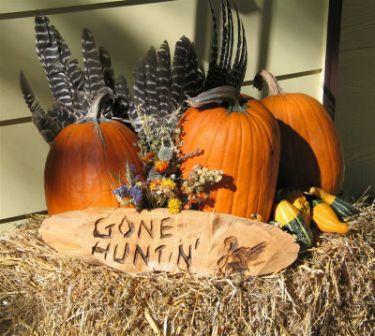 "I went grouse hunting on the public hunting grounds in Green County, WI where it backs up to Dane County with my english setter, Rebel. 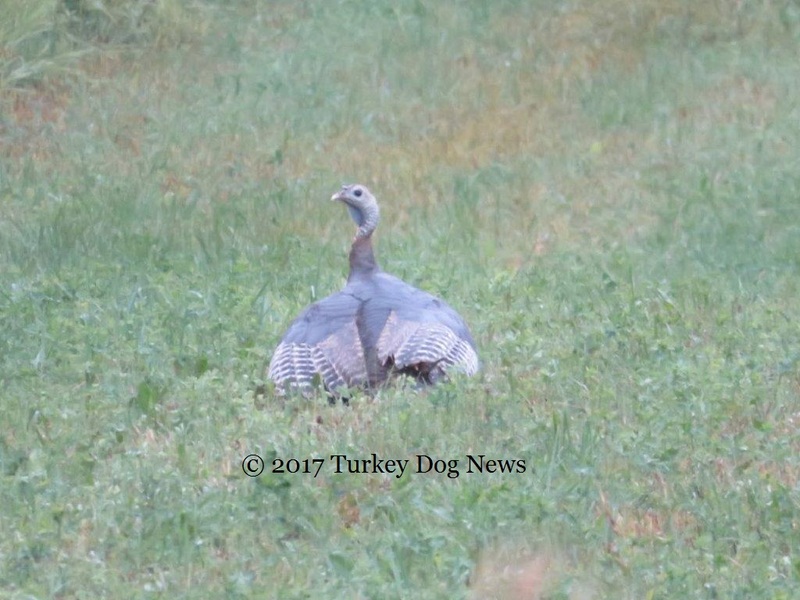 There was a wide field between the woods, and his first point was on a big ol' tom turkey. Reb was up on his tip-toes, and leaning ahead as if to try and see what that bird was. At first I wondered what he had. Reb never acted like that on a pheasant or a chukar, so I knew it wasn’t that. When the bird took off and its' wings made that whoosh whoosh whoosh sound, Reb's eyes got big as saucers. After that first one I could always tell when Reb had a turkey, because he acted so different, up on his tip-toes and leaning ahead, he liked turkeys so much. It was tempting to shoot, since I had a turkey permit in my pocket. But at that time you couldn’t be in possession of a turkey and a dog. 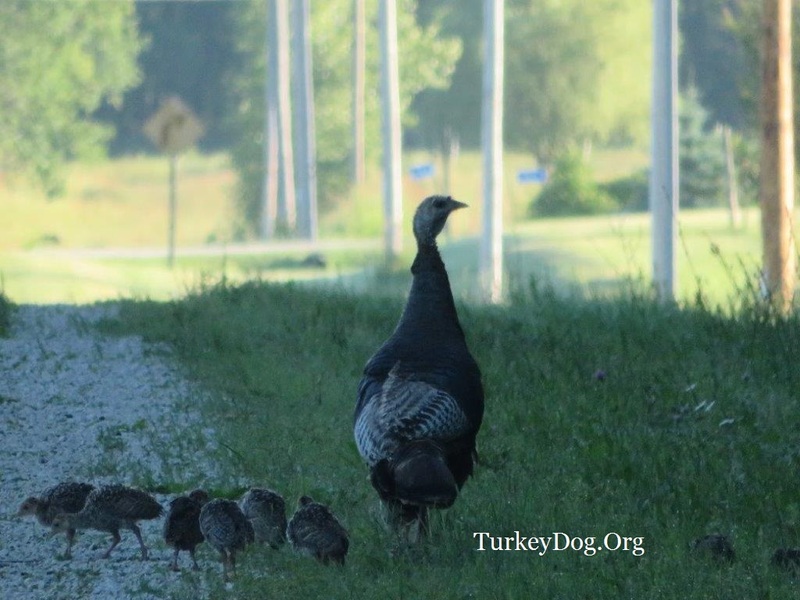 The fourth or fifth turkey Reb pointed that day was an adult hen. When it took off she flew right into a hunter (who was not with our party) that had been standing nearby. He broke several ribs, either from the hen, when he hit the ground, or both. 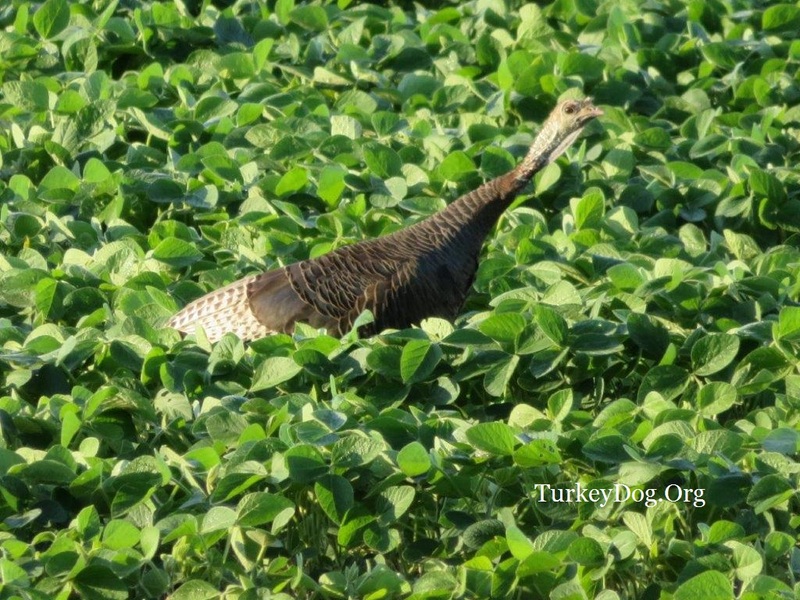 Another time Reb pointed two turkeys on a field trial grounds. I think Reb wanted to point turkeys better than anything else. He liked the helicopter-like sound of them flushing, and then he’d stand there watching them until they were out of site. Reb was one dog in ten thousand. The bloodhound is the only animal in the world whose evidence is admissable in court.